Cancer Lett 2014 348, 20-8. Obatoclax Mesylate (GX15-070) purchased from Selleck. Gx15-070 induces autophagy and necroptosis in TET cells. Time-course electron microscopic morphology of T1682 cells treated with Gx15-070 at the indicated concentrations. After 1-h treatment, lamellar bodies (yellow arrow) consistent with early signs of autophagy and mitochondrial structural changes with loss of cristae (orange arrow) were evident. After 6-h treatment, early signs of necroptosis with intact nuclear envelope (top panel), and mitochondrial swelling with loss of mitochondrial matrix and cytoplasm vacuolization were observed (bottom panel). After 48-h treatment, late stages of necroptotic cell death (yellow arrow) and advanced stages of autophagy (orange arrow) were evident. The bottom panel depicts advanced stage of autophagic cell death with cytoplasmic vacuolization and lamellar bound structures consistent with autophagosomes. Cell Death Dis 2012 19, 3:e351. Obatoclax Mesylate (GX15-070) purchased from Selleck. 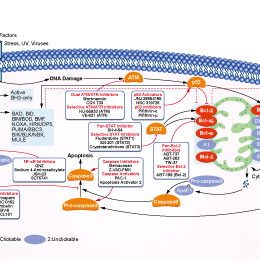 ffect of Gx15-070 of mTOR pathway and on AMPKα. Effect of 6h Gx15-070 treatment on T1682 cells compared with untreated cells and cells starved for 6 h. The treatment induced a progressive reduction of p-AKT (Ser473 and Thr308) and p-RPS6 with the exception of 500 nM concentration. Progressive increase of LC3B-II and AMPKα phosphorylation was observed in Gx15-070 concentration-dependent manner. Upregulation of A1 is crucial for resistance to ABT-737. The role of different anti-apoptotic Bcl-2 factors in determining resistance to ABT-737 was investigated, comparing the pro-apoptotic effect of ABT-737, antimycin A and obatoclax on activated (filled circles) and non-activated (open circles) BM3.3 CD8 T cells. T-cell activation induced resistance to ABT-737 and to antimycin A, but not to obatoclax, demonstrating a crucial role of A1 in this phenomenon. Percentage of cells treated with DMSO-containing vehicle is given. Half maximal inhibitory concentration (IC50) and 95% confidence interval (95% CI) are reported in the table. Cell Death Dis 2012 3, e299. Obatoclax Mesylate (GX15-070) purchased from Selleck. HUH6 cells (C-H) were incubated with and without 10 ng/ml TNF-α and obatoclax at 0.1, 0.3 uM. Fewer mitochondria with an intact membrane potential were observed in JC-1 staining when obatoclax and TNF-α were added to the culture. Reddish points indicate the aggregation of JC-1 in intact mitochondria, and missing of reddish points indicate the start of apoptosis. Exp Cell Res 2014 322, 217-25. Obatoclax Mesylate (GX15-070) purchased from Selleck. Cell proliferation assays were carried out in SET-2 cells treated with increasing concentrations of NVP-BSK805 (empty triangles/solid line), obatoclax (filled squares/dotted line) or NVP-BSK805 in combination with a fixed obatoclax concentration of 700 nM (filled triangles/stippled line) for 72 hours. BMC Cancer 2011 11, 24. Obatoclax Mesylate (GX15-070) purchased from Selleck. MEF cells were treated for 24 hours with the Bcl-2 antagonists Obatoclax Mesylate at the indicated doses.Acute survival was monitored by replacing the drug-containing media with normal media and incubating the cells until visible colonies formed.Clonogenic survival is expressed relative to the numbers of colonies formed following 24 hours incubation in normal media(lacking drugs). Dr. Christine Hawkins of La Trobe University. Obatoclax Mesylate (GX15-070) purchased from Selleck. MDB-MA-231 cells were exposed to 30 μM cisplatin in the absence or in thepresence of 1 μM Obatoclax Mesylate .The cell were stained with Hoechst 33342,MitoTracker Red and Yo-pro-1. Dr. Zhang of Tianjin Medical University. Obatoclax Mesylate (GX15-070) purchased from Selleck. Obataclax triggers cell death similarly in parental and ABT-737-resistant cells. Parental and ABT-R cells were treated with obataclax (Nalm-6 and Nalm-6 ABT-R: 10 uM; Reh and Reh ABT-R: 5 uM) for 18 h. (A) Cell viability was determined by trypan blue exclusion assay. (B) Mcl-1, NOXA, Bim, and b-actin as a loading control were analyzed by immunoblot. Obatoclax Mesylate (GX15-070) purchased from Selleck. Potential 1st-in-class small molecule antagonist of Bcl-2 designed to inhibit all relevant Bcl-2 family members, including Mcl-1. A predicted binding affinity for Obatoclax binding to BCL-2 is calculated using the SIE scoring function. As a control in determining the reliability of the calculation, predicted binding affinities Ki) are calculated for a set of 12 small molecules with experimentally measured binding affinities to BCL-2. Method: Obatoclax is dissolved in DMSO at a stock concentration of 5 mM. Cell viability is assayed by MTT. Human MM cells (HMCLs), peripheral blood lymphocytes (PBLs), bone marrow stromal cells (BMSCs) are seeded in 96-well plates at a density of 2 × 104 per well for HMCLs or 5~10 × 103 for PBLs. 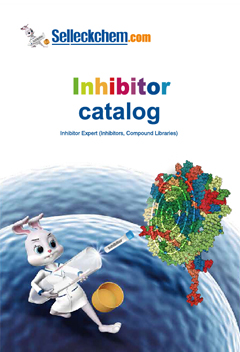 Various concentrations of Obatoclax are added to the cells, with or without IGF-1 (50 ng/mL) or IL-6 (10 ng/mL). Cells are incubated for 48-72 hours and cell viability is determined. Animal Models: Female BALB/c or CB17 SCID/SCID mice bearing SW480, C33A, PC3, and 4T1 cells are used. Nguyen M, et al. Proc Natl Acad Sci, 2007, 104(49), 19512-191517. Trudel S, et al. Blood, 2009, 113(2), 299-305. Huang S, et al. Clin Cancer Res, 2009, 15 (1), 150-159. Naim M, et al. J Chem Inf Model, 2007, 47(1), 122-133. ABT-737 : Bcl-xL, EC50=78.7 nM; Bcl-2, EC50=30.3 nM; Bcl-w, EC50=197.8 nM.